Let's visit. I'll show you the way. The big bend in Atlanta's downtown connector is the "Grady Curve." There sits the massive blond brick "H" that is Henry W. Grady Memorial Hospital. "Grady" is the one of Atlanta's most familiar icons, seen on every trip to the airport. It's THE downtown landmark for our traffic reports. Like most Atlantans I'd never been there, until Wednesday. 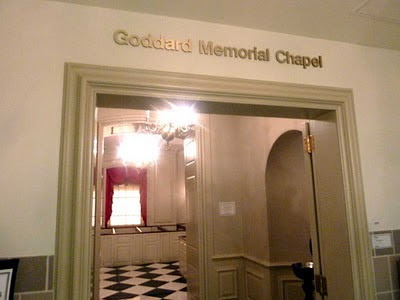 In advance of the Shutze Awards on February 12, I trekked to Grady looking for the Goddard Chapel. The Grady colossus overwhelmed me. This is the new, heavy deco portico; or is it a porte-cochere. Remember, we're looking for this elaborate pulpit with tester. Map Tip: South on Courtland, left on Gilmer, right on Jesse Hill. Park in the big deck with the McDonalds. Now that I know, it's easy to get there. Grady's main entrance is up a gentle ramp to the curved green main entrance. We're looking for the red curtains on bricked up windows, the Ten Commandments in gold leaf. I was on the ground floor. I was close, the chapel is on the 1st floor. I asked directions at the desk in the atrium. "That way to the elevators then up the 1st floor." "That way" led to the main lobby elevators. I rode up to the first and looked for the Narthex of the Goddard. That chaplains' offices are next to the chapel. There are plenty of signs. It's down here. The black and white marble floor gave it away. The many chandeliers and sconces cast many shadows. I didn't hear the tiny organ. The box pews have kneelers. Outside and inside this quiet haven Grady's humane business carries on. 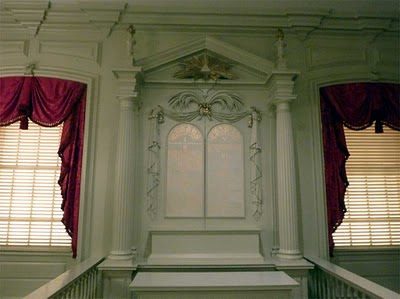 The restoration of the chapel won a 2010 Shutze Award for Craftsmanship. Here is the citation by Calder Loth. *Our next awards category is Craftsmanship. We cannot have lasting architecture without decent craftsmanship. And we cannot preserve our architectural monuments without skilled craftsmen involved with maintenance and restoration. This was vividly demonstrated in the restoration of Philip Shutze’s Goddard Chapel, located in the Grady Memorial Hospital here in Atlanta. This jewel-like space had been subjected to well-meaning but misguided treatment over the years. The original hand-rubbed paint finishes had been whitewashed. The gold leaf details were spray-painted with cheap gold paint which blackened. The windows were blocked up, removing natural light. A crude HVAC system played havoc with the quiet ambiance. Its original crimson damask curtains disappeared. *Through the sponsorship of the Henry W. Grady Health System Foundation, to whom this award is given, the chapel was meticulously and lovingly restored to its original character. This included the *restoration of original finishes; replication of the damask curtains and new window blinds, *carefully reproducing the curtain tassels; *repair of damaged carvings; restoration of many of the fittings; and installation of a new lighting system with special lighting for the blocked windows. *The award is accepted by Suzanne M. Begin, Executive Director of the foundation. Congratulations to you and your foundation for this work of love. I'm rather intimidated. I'm blogging two tiny chapels by Philip Trammell Shutze. So much to say about 2 of Shutze's most public works, here's a preview. 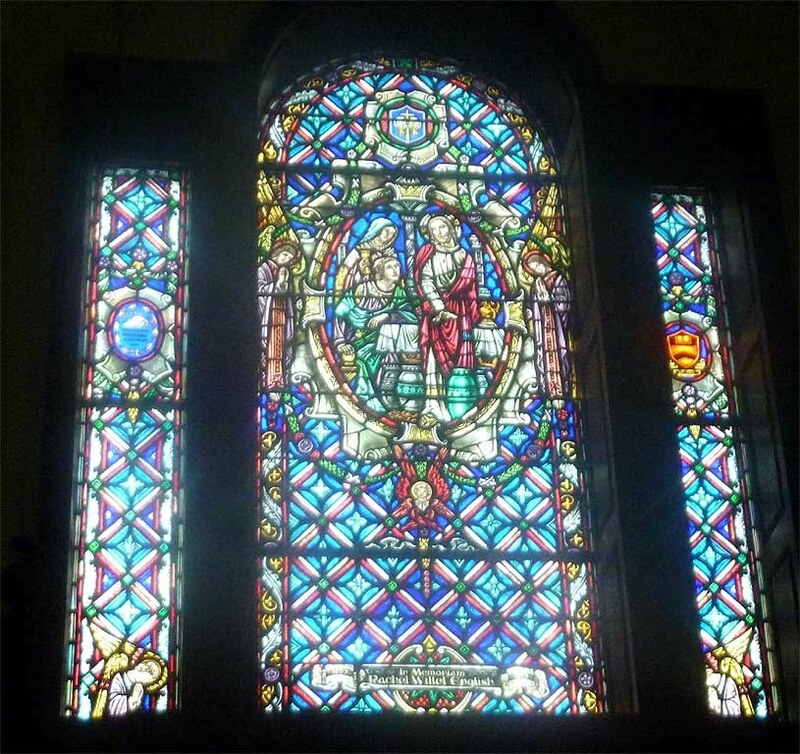 The Little Chapel at Glenn Memorial United Methodist Church at Emory has this one stained glass window by Willet. The Little Chapel "doesn't express itself" on the outside. It's in here, occupying the first and second floor to the right of the door. Shutze's Goddard Chapel at Grady Hospital has the Ten Commandments in gold leaf. It's right here in Atlanta's Grady Hospital, can't you tell? 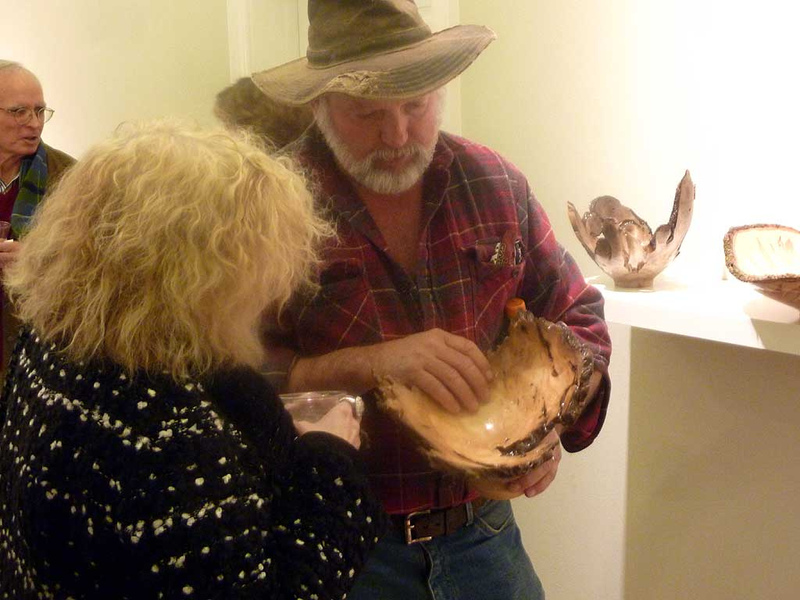 Here is Butch Reagan showing one of his bowls at his opening reception at the Swan Coach House Gallery. "Bowl" is a modest word to describe these. Butch's experience running a sawmill in North Georgia gave him a keen eye for wood and how to a bring out the best features. The pink color is from the worms. See the holes? Butch said you had to treat the wood properly the keep the colors. There are some pictures from his workshop. Atlanta art fans will recognize Marianne Lambert, the curator for Swan House, Marianne of the red hair and big smile. You'll see Marianne at openings everywhere. If you see her, you are probably in the right place. Here is a bit about Butch's discovery. This is his first show. You need to get over there while his work is under-priced. They are practically giving his work away. The latest trends in garden homes and decor are 2000 years old. What a night. Georgia Tech professor Doug Allen presented "Villas of the Roman World" at Emory's Carlos Museum (see the Carlos social media page) on behalf of the Southeast chapter of the ICA & CA. Lot's of villa fans were there. If you haven't been to Pompeii, have a look: House of the Tragic Poet, House of the Faun and the relatively modest House of the Small Fountain - Fontana Piccola, shown below. The Carlos lecture room lobby is special don't you think? Closest you can get to the Porch of the Caryatids without leaving Atlanta. The lighting simulates clerestory windows. 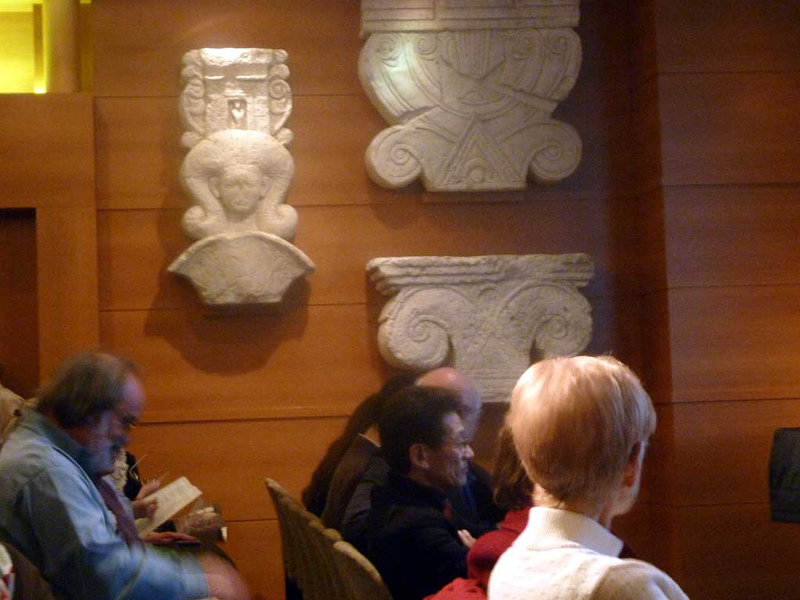 I wasn't expecting so many folks: architects, students, landscape lovers, antiquity lovers and lover lovers I'm sure. Elizabeth Hornor, Director of Education, welcomed us on behalf of The Carlos. Betty Dowling introduced Professor Allen on behalf of the ICA & CA. Douglas Allen used gestures, laser pointer, Latin words, slides and wit. The crowd literally oohed and aahed. I oohed and aahed out loud. The House of the Faun covered a Pompeii city block. It was over all to soon but the crowd was happy. The lobby is a very comfortable place to chat after the show. Tuesday was an extraordinary day. I did stained glass tours in Saint Mark United Methodist Church and St. Luke’s Episcopal Church in an afternoon. I'm at a loss to put the experience into words. I'll just start here. There is some music at the bottom. 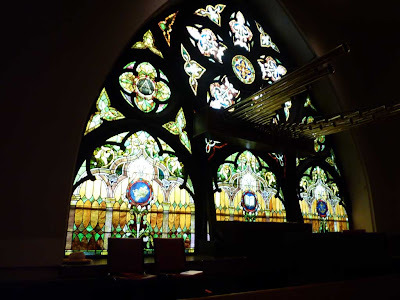 It's the ultimate for Architecture Tourists: Two old Atlanta Churches by Atlanta's great architects, windows that took decades to complete, acoustics to make voices and grand organs sing and roar, designed to inspire and lift the human spirit. Best of all, these places work every single day. Not bad. It's too much to take in: here are just a few square feet at Saint Mark. For now let me thank Bobby Mays from St. Luke's who put this together for us. And I want to thank my fellow tourists shown here at Saint Mark. Bill Barber, Our Saint Mark host: Senior Pastor, Rev. Dr. Beth LaRocca-Pitts, George Houston, Bobby Mays, Bill Lyons, Warren Williams. Starting as near complete strangers, we certainly found a lot to talk about. This is what it's like to enter Saint Mark. And to enter St. Luke's. Pool House Classical on Krog Street - Really? Stained Glass Sunday - Tiffany, Downing et al.